Making is the Solution to Job Loss from Automation. A. "Manufacturing jobs strangled by government regulation.."
WRONG: None of the above. They were automated away. Workers were replaced with machines because technology advanced, the corporations invested in it and reaped the rewards. Worker productivity continues to increase, while worker pay is stagnant because automation increases productivity and reduces worker demand. The job gains we have seen are all in the minimum wage jobs (not worth automating) and high end jobs (too difficult to automate). The jobs in the middle are worth automating and can be automated. The obvious solution is to shift people up into jobs that require more education. The blockage is overpriced education and lazy people more interested assessing blame than in learning. The real solution may be new age hippie Makers: Dropping out, becoming self sufficient, and/or embracing automation and letting the robots they build and own do the work for them. 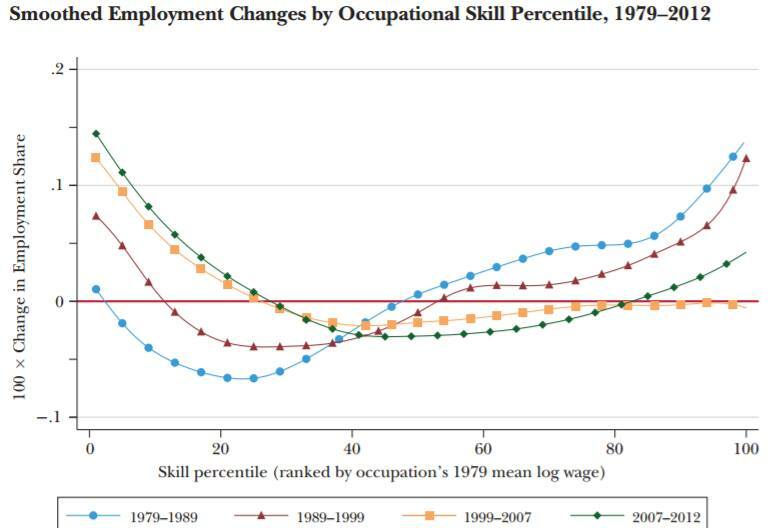 If you look at a graph with the income a specific job provides arranged from left to right, with minimum wage on the far left, and CEOs on the right, and setup the vertical axis to show jobs lost or gained, what you will find is that while we have actually gained jobs over all, those gains have all been on the far left (minimum wage jobs, not worth automating) and on the right (jobs the require creativity, education, deep understanding, etc... which can not yet be automated). In the center, jobs where humans do hard, repetitive, mechanical work that does not require great education, are actually being lost. It started computers in the early 60s. At that time computer was a job description, the computers were humans whose job it was to compute. Youve probably heard of the Unibomber; Ted Kaczynski, but did you know why he was so pissed off? Two things: 1. He was literally abused in Henry Murrays human experiments at Harvard, and 2. His life's calling was doing computing tasks in mathematics where were replaced by the first machine computers. The Unibombers manifesto is very worth reading, although his methods were ineffective. We will see more and more like him as jobs are lost, and cruelty continues. But the real impact was felt with factory jobs in the late 60s and 70s. We built huge machines that turn out parts, process foods, and produce simple goods far faster, cheaper, and in most cases, with higher quality (or at least higher consistency) than humans. 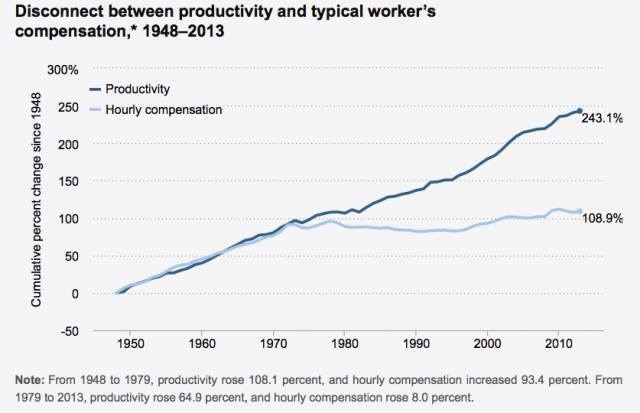 It was at this point that we see the increase in productivity decouple from the increase in wages. Human workers continued to earn the same amount, while producing more with the help of machines and automation purchased by the owners and investors of the companies. Then in the 70s and 80s big ticket, complex, high volume items like cars, planes, appliances were transitioned into robotic factories. At that time, we started seeing some of the production which had been outsourced in the 60s, especially heavy items such as cars, return to the USA, because increasing shipping costs will always limit outsourcing. But that return did NOT mean a return to employment of factory workers, because the new factories were automated it takes far fewer humans to tend, program, and repair robots than it takes to do that work directly. The new jobs were either minimum wage (robot tenders) or high end (programmers, repair, management); no skilled craftsman need apply. In the 90s the automation trend continued and expanded to include construction, road work, transportation systems, laboratory work, and many other areas. In the 2000s we are seeing a transition to the automation of custom work. CNC, 3D printing, open CAD, etc... took a bite out of custom fabrication and prototyping shops while at the same time reducing the cost of prototyping and customized production. Again, more production returned to the USA, this time because of wage stabilization in China, India, etc... where workers are now earning only a fraction of what US workers cost, instead of a small fraction. Today, middle class jobs are going away at the fastest rate ever. Robots are becoming less expensive, easier to setup and program, and so are replacing more and more small scale jobs on a wider bases. Baxter, and Sawyer from ReThink Robotics are good examples. Budweiser just delivered the first big rig full of beer via a totally autonomous 18 wheeler. It drove with a human on board, but he literally crawled in the back and went to sleep as it rolled down the road. Truck drivers make $50 to 75 thousand. They can only drive 8 hours a day, by law so that $150,000 truck is sitting there doing nothing for the trucking company 2/3rds of the time. A self driving truck needs only a minimum wage truck tender to watch over it, load and unload, report breakdowns and do simple repairs and maintenance. So the trucking industry, with a one time investment of a few thousand per truck, can reduce labor costs by $35 to $60 thousand per year, trippel their operational capacity, and probably decrease loss by increasing safety (self driving cars are stunningly safe compared to humans). My rough calculations are a savings of $20 to $60 BILLION a year for the industry as a whole. So... what is the answer for the humans who are being made redundant? Return to a simple life? An interesting experiment, and some do. However, it is inefficient, and its adoption on anything like a widescale basis would result in horrible starvation, wars, and loss of life. We need the machines (and the oil for fertilizer and pesticides) to produce the quantity of food at the price we can pay to feed our populations. Automation is a wonderful thing, which benefits all. Sadly, it benefits those who invest in it far more than those who do not. or read The Dictators Handbook by Bruce Bueno De Mesquita & Alastair Smith. Trust me, Basic Income aint happening. Prison? The people who cant, or wont, retrain to become useful to an automated society and who are not in the few remaining jobs robots cant do better... lose economic value, and become a drain on society. At some point, they beg, borrow, and eventually steal to survive. Our current solution to this problem is to toss those people in jail, or kill them. This is FAR more likely to be the solution we stick with as the problem grows. Nearly 1 in 100 people in the USA are in jail. Prison population is approaching 2.5 MILLION. The interesting data point here is that it costs about the same to house a prisoner as it does to pay someone a basic income; on average, $31 thousand a year, vs $28 thousand cost of living. And that includes a tidy profit for the private prison industry. Death? Of course, the ideal solution, from a purely economic perspective, is simply to kill those who are not productive. For that, we have wars, street violence, and suicide. To be honest, war doesnt really kill that many Americans. Young men (and women) are more likely to die in a car crash at home than in a foreign war. Street violence is serious with about 16,000 deaths per year. Suicide is the big story; rising 24% in the last 15 years from under 30,000 in 1999 to nearly 43,000 in 2014. Suicide by workers in the oldest age bracket (least likely to be able to shift into the new jobs) has increased 45% to 30 per hundred thousand. Re-education? The cost of a college degree has spiraled out of control in the last 15 years, rising 90% from about $3,400/year to more like $10,000 for the lowest cost (public, 2 year) schools. At the same time, the difference between the highest level schools and the cheapest has more than quadrupled. The change is less due to increase in the actual cost the school incurs to provide an education, and more to a decrease in funding from State and Federal governments. Making what you need for yourself: I have hope that this is the real solution to the problem. Self sufficiency. If individuals embrace technology they may be able to use machines to make what they need to fend for themselves and avoid the need to compete for jobs being taken by machines. Food: Of course, I dont suggest we leave modern innovations behind. A 1/5 acer lot in Pasadena, home of the Dervaes family produces roughly 5,000 pounds of food a year and uses solar panels to run the computers by which they take orders from local restaurants for edible flowers for fancy salads. FarmBot.io offers a CNC machine like gardening robot said to produce enough veggies for one person and pay for itself in 3 to 5 years use. Closer to home, Ag Pals provides excellent design and installation of rainwater harvesting and aquaponic systems for food production using 1/10th the water and 6 to 10 times the density. OurSunCooks.com makes cheap but very effective solar cookers from commonly available materials. Products: And you cant be replaced by a machine if you are the one using the machines to make products that other people will purchase. Multiple small businesses and startups were enabled by their founders learning to solder, program, cast plastics, and other critical skills at the local Maker Faires. Many of these people have gone on to make a living selling products. AryaBall is a local success story. The Maker Movement: And so we come to the Maker Movement: Maker Faires, the STEAM Maker Fest, Maker Places, and all form of interesting open source projects. These are a way for people to share, largely outside the capitalize monetary system, their abilities, successes, failures, and lessons on how to make things yourself. The typical Maker Faire has more than 200 exhibitors who are not selling or buying anything; they are not charged for the exhibit space. These people are proud of what they made, and the Faire gives them a chance to be appreciated for it. But more than that, they are universally willing to share how they did it, and show others how they can as well. The cost of hosting the Faire is paid by sponsors, mostly corporations eager to advertise their products, and by the ticket price for the attendees. Every Faire includes Hands On Activities where attendees learn how to make something themselves. Nearly always included is Soldering where a simple electronic circuit is constructed and a valuable skill is learned. The range of methods and results is truly stunning. At the Faire, you will see everything from Aquaponics to Automatons, Basket weaving to Bio hacking, Candle making to Computer driven cars... There is a misconception that Maker Faires are about high tech, and while there is a lot of that, we fully support ANY making of any kind. If you can teach people to sew, we want you. Canning, Gardening, Husbandry, Weaving, Pottery, Haberdashery, you name it, if you make it, we will make room for you.